Oral-eze Dental Emergency toothache medication acts fast to relieve toothache due to a cavity until a dentist can be seen. Toothache due to a cavity (eg. lost fillings, decay etc.) is the most common cause of toothache. It is specially formulated with three way action - anaesthetic, anti-inflammatory & antiseptic. It contains benzocaine 7.5% w/v and clove bud oil 19% v/v. It acts in minutes to give relief from toothache. It is a complete first aid pack for toothache containing toothache medication (5ml) and cotton wool applicators. It is suitable for adults and children over 2 years. Moisten the tip of the applicator with 1-2 drops of Oral-Eze and place in cavity for 1 minute. Avoid use in pregnancy. 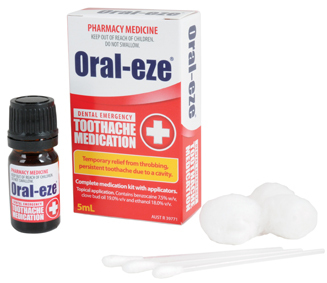 Oral-Eze is made in Australia. Store below 25°C. This medicine may not be right for you. Read the label before purchase. Follow the directions for use. If symptoms persist, talk to your health professional.